Sea urchin roe is an acquired taste. Served as sushi, uni—the Japanese word for this delicacy—is actually the reproductive organ of the sea urchin. One of the most highly valued coastal fisheries in California is the red sea urchin (Mesocentrotus franciscanus), found in the Pacific Ocean from Alaska to Baja California. Red sea urchins are sold to processors who determine the price of each uni batch based on its quality—a function of its size, shape, texture and color (usually orange to yellow). As a part of her doctoral dissertation at UC Santa Barbara, marine ecologist Sarah Teck explored how sea urchin quality could be quantified and used to predict fishermen's behavior. She and her colleagues found that understanding the local dynamics of this fished resource can make management strategy evaluation and planning more effective. The findings appear in the journal PLOS ONE. "Our work quantifies some of the rich information that sea urchin fishermen have known for years about this valuable resource," said Teck,who is currently a UC MEXUS-CONACYT postdoctoral fellow at the Universidad Autónoma de Baja California in Ensenada, Mexico. Over a three-year period, Teck examined more than 2,500 specimens from sea urchin fishermen working throughout the seasons in the Santa Barbara Channel. Using California Department of Fish and Wildlife data, the researchers identified a predictable pattern: When the quality of uni improved, fishermen got better prices, so they fished more. The scientists also documented patterns of fishing across the seascape. Numerous factors determine the behavior of fishermen collecting these organisms from the wild, including weather and seasonal supply and demand. 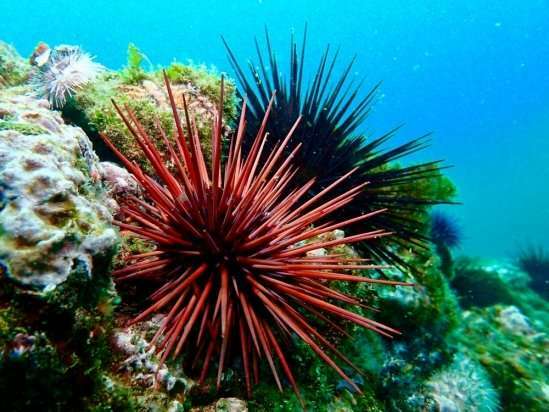 However, the study found that a significant predictor of sea urchin fishermen's behavior stems from the animal's seasonal reproductive cycle. "We always knew that sea urchin fishermen follow the 'gold'—and fish more when the product is better," Teck explained. "But we were surprised to find that the organism's reproductive cycle explained such a large percentage—between 69 and 92 percent—of the variability in catch, price, effort and value within the industry." Sea urchin divers respond to the resource quality—in this case, the timing of the reproductive cycle. In the northern Channel Islands, when quality is higher (in the fall and early winter), their product is worth more money, so divers harvest larger quantities. However, the study also provided evidence that the sea urchins' reproductive cycle in Southern California differs significantly from published patterns in the north, where statewide fishing regulations initially were developed. According to Teck, recent shifts in the marine environment—such as extreme warming events, sea urchin disease outbreaks and kelp loss in certain areas—likely have played a significant role in the recent 46 percent reduction in sea urchin catch statewide. "Although the general patterns from our data may be considered common knowledge within the sea urchin industry, we have identified a method to predict the performance of the fishery based on a simple measure that can be used for management purposes," Teck said. "An adaptive management scheme applied on a smaller spatial scale may be more effective—especially given the extreme and rapid ecological and environmental changes that have occurred in the region in recent years."